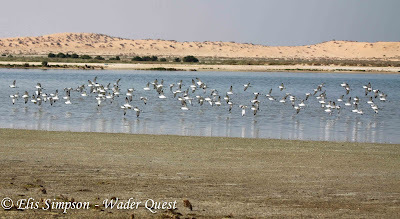 Wader Quest: Crab Plover and Cream-coloured Courser. Crab Plover and Cream-coloured Courser. 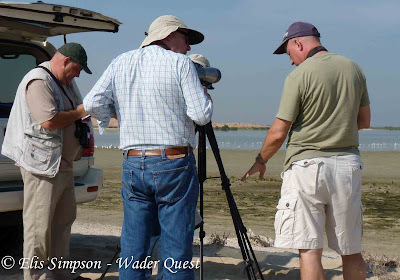 When we were planning the UAE section of Wader Quest there was one bird, even though it wasn't the rarest, that stood out as a must-see bird, the Crab Plover. If I'm honest that was our reason for going to the UAE above all else. Tommy had pretty much assured us that we would be unlikely to miss it, but even so, as we set off in the morning having been collected by Tommy who was transporting us that day, the anxiety levels were high. 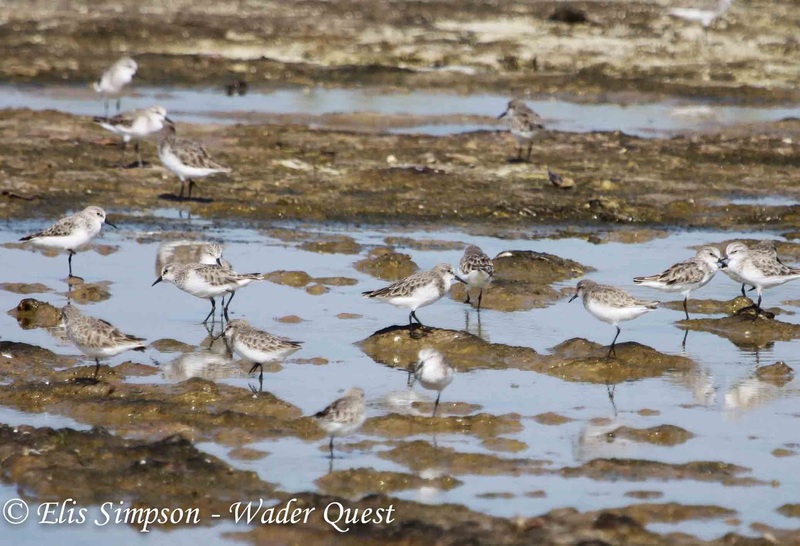 Maybe it wasn't just the thought of seeing the Crab Plovers though that was getting to us. 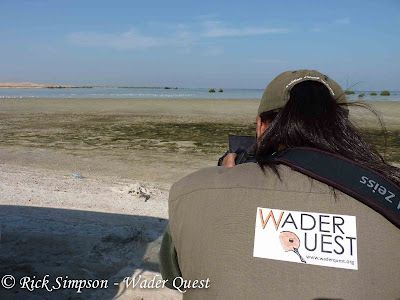 We were also to meet a reporter from The National newspaper, one Colin Simpson (no relation), who was doing a follow-up report about Wader Quest having mentioned that we were coming a couple of weeks ago in his column. We all met up on a desert road, close to the Crab Plover site. Tommy and me waiting along a desert road for the journalists. 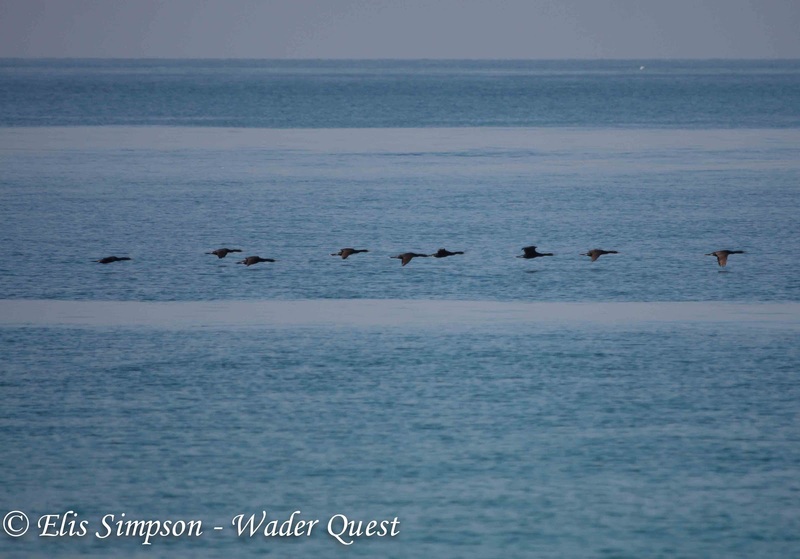 Once we were all gathered we set off together to look for the plovers. 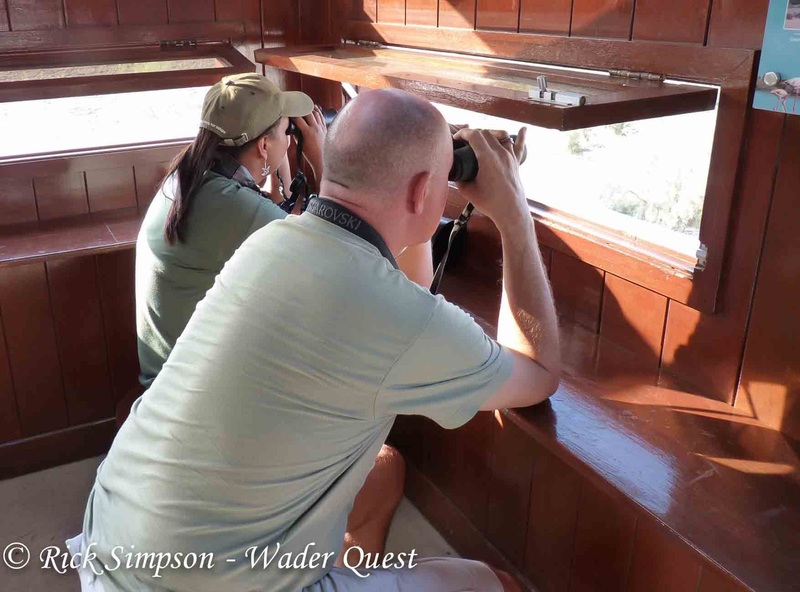 At least from this point of view we needn't have worried, there were plenty of birds for us to admire, Tommy counted 237! 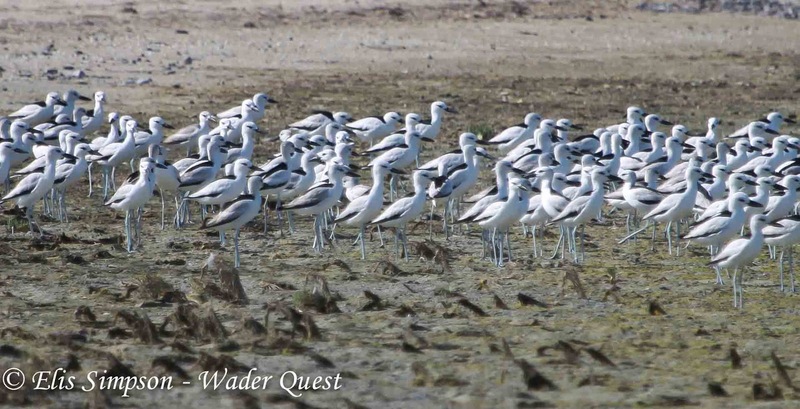 Part of the Crab Plover flock. We spent many happy minutes just feasting our eyes of the marvellous spectacle that confronted us. 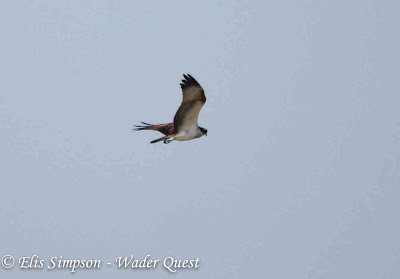 An Osprey flew over and spooked the plovers and other shorebirds so we got to see them in flight too, double bubble, really lovely birds. Overflying Osprey, the birds don't seem to know it only eats fish! 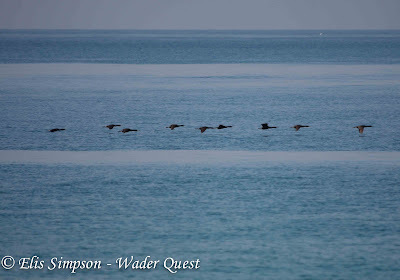 Crab Plovers in flight as a result of the Osprey's fly-past. 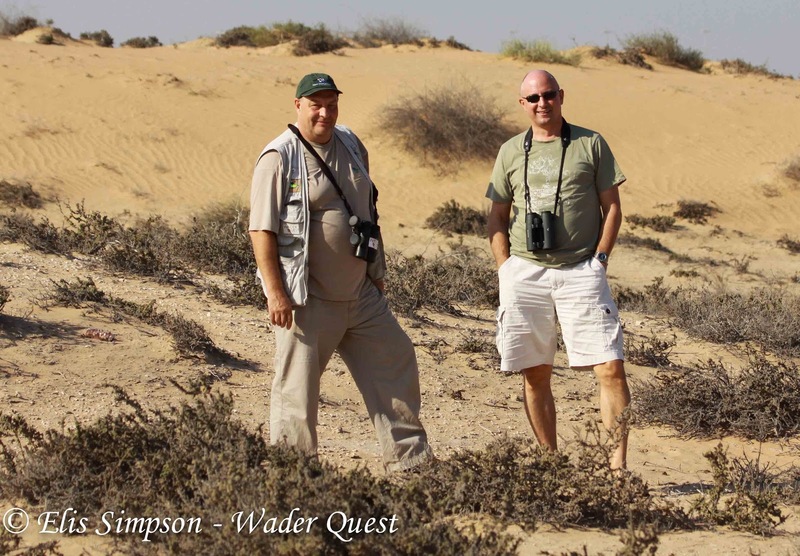 Tommy explained to Colin a little about the breeding biology of these birds on some of the outlying islands in the Gulf. 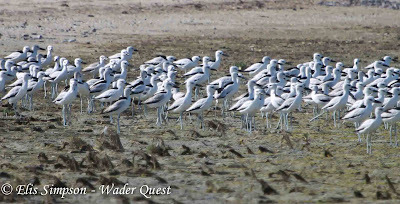 Their breeding is quite extraordinary, not only do they nest communally, uniquely among waders they do it in a burrow that they excavate in the sand! 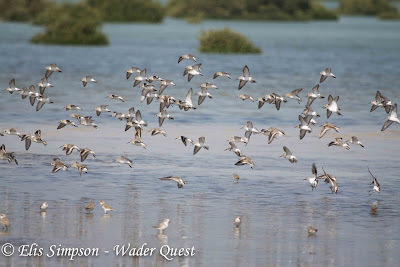 I eagerly write "Crab Plover" in my notebook, such joy! After spending much too long salivating over these beauties, the time came for the serious part of the morning, the awareness raising component of our stay in the UAE. 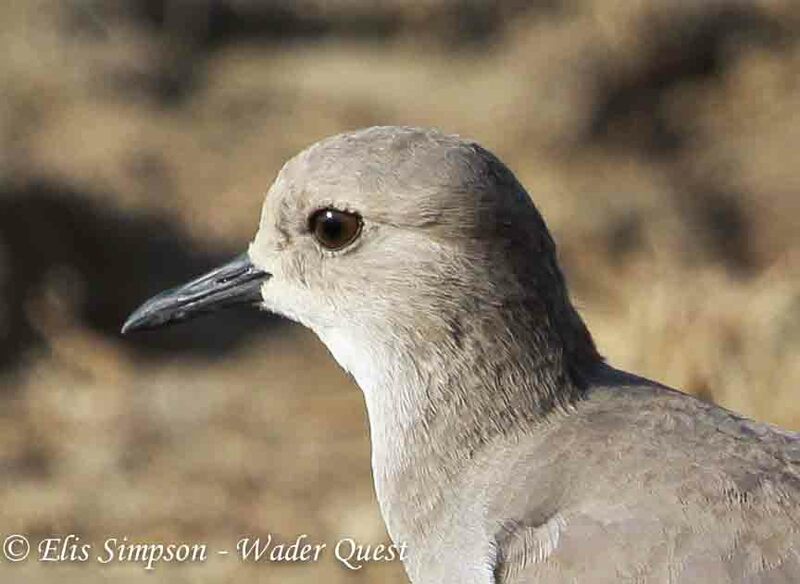 Colin asked us both various questions about the plovers and about Wader Quest and we answered nervously, remembering that this time our words would be recorded and then repeated, no room for error or apocryphal tales. Colin then left us with the newspaper's staff photographer that had accompanied him, Pawan Singh, and we set about checking out some of the other waders on the beach. Pawan, Tommy, Colin and me in earnest discussion. 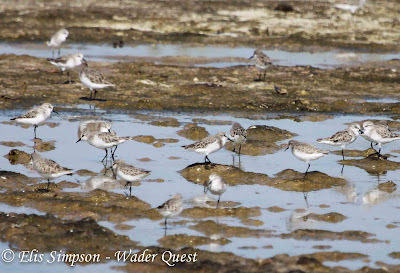 The only other new bird for Wader Quest there was a group of Little Stints; I have never seen so many together before there were around 100 in all. 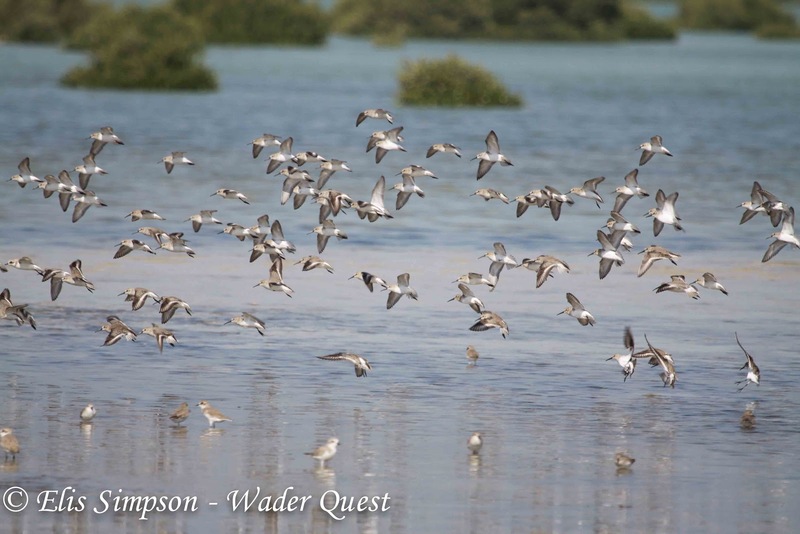 A flock of Dunlin coming in to land. There was however an all too familiar tale with this site and one that left a bit of a downer on proceedings when Tommy told us that the area was being developed as a marina. The first luxury homes had already been built when in 2008 the economic downturn halted the development. 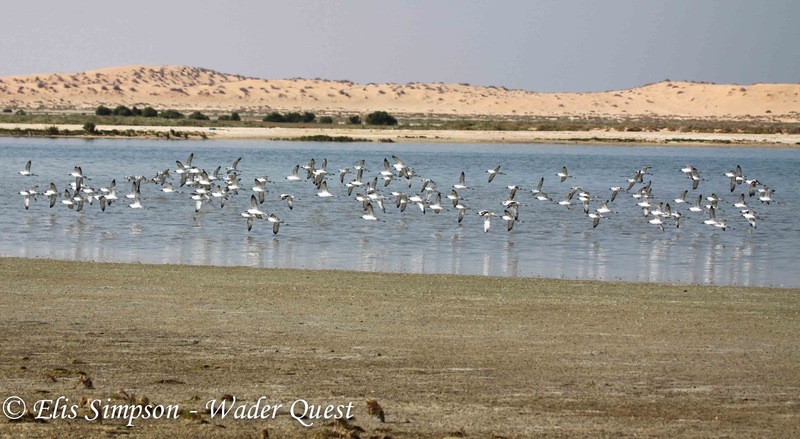 But lamentably this is not a reprieve, just a stay of execution, as we stood there gazing across the bay to the picturesque peninsula alive with shorebirds, it saddened us to think that one day, these birds would lose this productive feeding area. Sad to think this will one day be another marina. 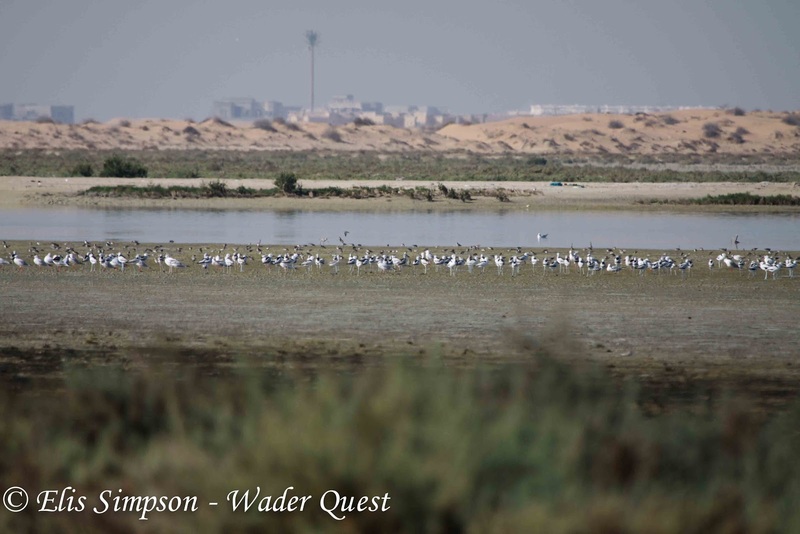 From here, after a quick stop to see the endemic Socotra Cormorant, we headed for Ghantoot in Abu Dhabi. At this site we were after the Cream-coloured Courser. Tommy nervously warned us that this could well be our first miss of the quest, they are notoriously hit and miss at the Polo Club. 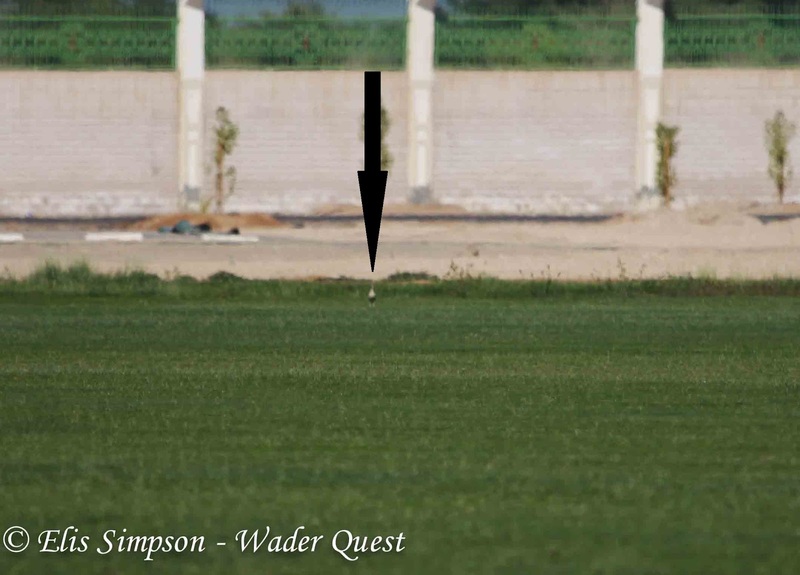 The first place we checked drew a blank, nerves were rattled, but when we arrived at the second (and last) site, there, right over the other side of the greensward, was a Cream-coloured Courser, in fact in the end we saw 5 individuals. We sat and ate a celebratory lunch that consisted of delicious sandwiches that Tommy's lovely wife, Maja, had prepared for us. As we ate a Eurasian Sparrowhawk flew over and after eating we returned to see if the coursers were any closer for photographic purposes only to find that they were not there at all. Cream-coloured Courser arrowed in case you missed it! 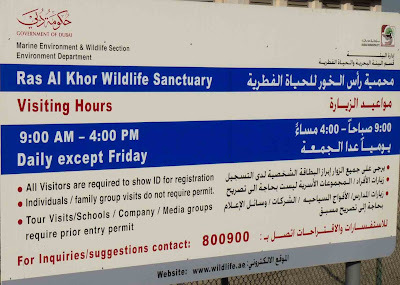 Of course without Tommy's intimate knowledge of the UAE and its birds we would not even have been in the right place, but even with all the preparation in the world, sometimes you still need a little bit of lady luck, and it seems she was on our side again today; you've got to love that lady luck! 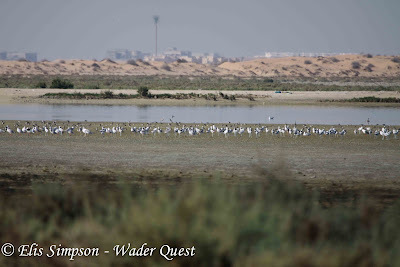 Moving on we returned to the pivot fields in Dubai, we got more splendid views of the lapwings, better in fact, from the cover of Tommy's 4x4, an essential birding tool in the UAE. 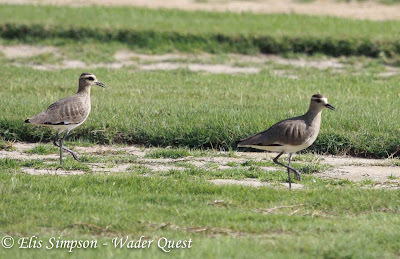 Two of the four Sociable Lapwings at the pivot fields. 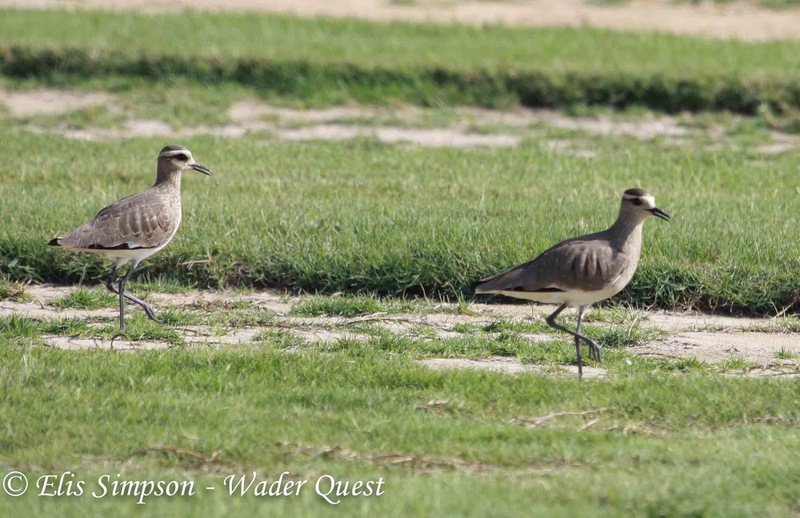 White-tailed Lapwing; I told you we got closer! 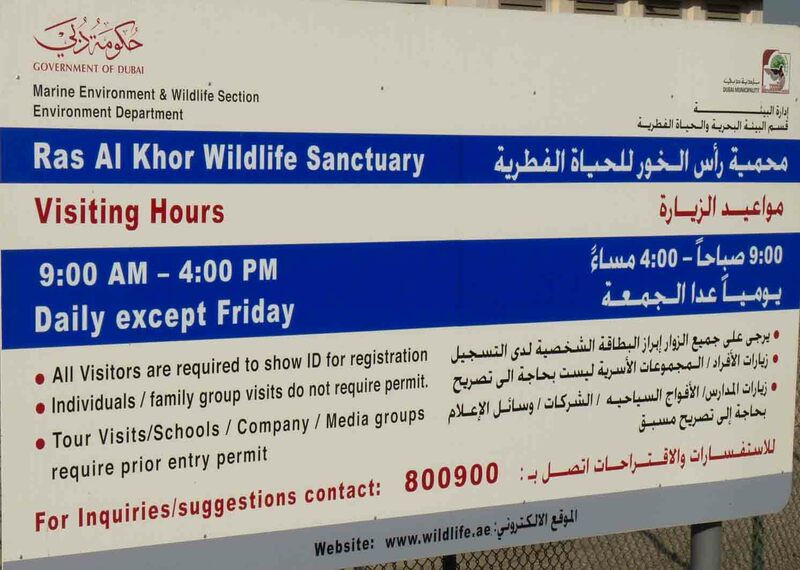 Our last stop of the day was at a wildlife sanctuary outside Dubai called the Ra's al-Khor Wildlife Sactuary. From there the distinctive Dubai city skyline looked most spectacular. 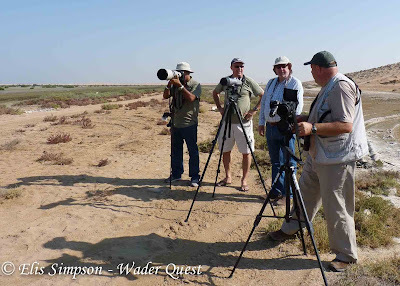 At the sanctuary we added a couple of new birds for the UAE list, but nothing new for the Wader Quest list unfortunately.This did not however stop us from retiring very satisfied with the day's events and very grateful to Tommy for all his planning and help on the day, without which we would most certainly have struggled.